The decision to go public; The players; The offering process, Part I; The offering process, Part II; Determining the value of an IPO company; Documentation and due diligence; UK offerings; US offerings; Marketing new issues; Syndication and fees; Allocation, stabilization, and lock-ups; Secondary offerings; References. An initial public offering (IPO) is one of the most significant events in corporate life. It follows months, even years of preparation. During the boom years of the late 1990s bull market, IPOs of growth companies captured the imagination and pocketbooks of investors like never before. This book goes behind the scenes to examine the process of an offering from the decision to go public to the procedures of a subsequent equity offering. 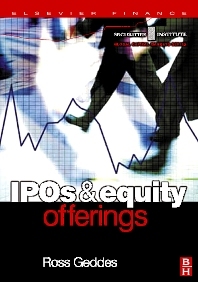 The book is written from the perspective of an experienced investment banker describing the hows and whys of IPOs and subsequent equity issues. Each aspect of an IPO is illustrated with plenty of international examples pitched alongside relevant academic research to offer a combination of theoretical rigour and practical application. Corporate financiers; equity capital markets personnel; equity sales and research; institutional investors; hedge fund managers; regulators; investor relations people; finance directors; treasurers and chief executives; graduate business and finance students; management and strategy consultants; institutional investors.